Granted, walking around with two jhereg on your shoulders is not the best disguise for an ex-assassin wanted all over the Empire. But a young boy saved his life and then needs help, Vlad Taltos pays his debt--even if it means uncovering a financial scandal big enough to bring down the House of the Orca and the entire Empire. ©1996 Steven Brust (P)2012 Audible, Inc.
As this book switches perspectives between two characters, the decision to split the performance between Mr. Clark and Mrs. Masters was great. With Bernard's well established Vlad laying the foundation, Mrs. Masters 'Keira the Thief' takes off. Another great book in the series ... though the storyline involves banking and finances. I'd prefer that Vlad would "get out of the forest" and get back to his street mystery solving. I was nervous as a new narrator starts out this book. She does a great job, but I'd prefer to stay with Clark the entire book. Vlad continues his life on the run from the Jhereg, this time with a catatonic companion in tow. In Orca, Vlad is searching for a way to heal his companion Savn, who the audience met in the previous installment. He happens upon an old healer who is the midst of losing her property. Vlad brokers a deal to help her keep her land, while she cares for Savn and finds a method to heal him. But there is more going on than just a property deal, as Vlad quickly finds out. While still a good story, it feels like the overall plot has come to a bit of a stutter here, the reader could almost consider this filler. Almost. The most important part of Orca is that we get somewhat of a resolution for Savn's involvement in the story, which carries over from the last book. Full of twists and turns and even a few big surprises, the book doesn't disappoint, but you could easily skip over this without missing a beat in the overall story. 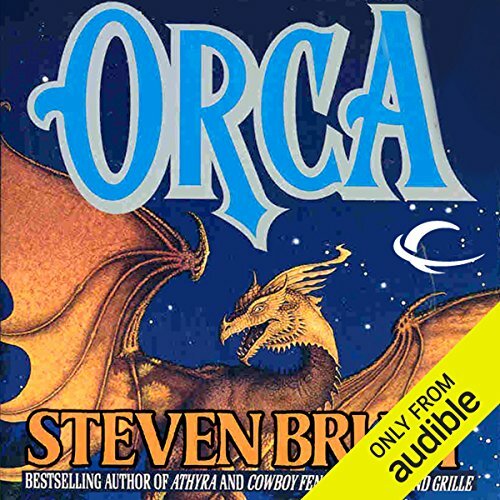 For Orca we get the pleasure of listening to two narrators. Masters gives us a great Keira the Thief, while Clark reprises the always smarmy Vlad. Masters gives a bit of a celtic accent to Keira, which Clark has done a bit of in previous novels; it's good to see a bit of vocal continuity, especially since most of the story is told by Keira the Thief. Good story, but bigger and better things are to come later in the series. I liked in the end the two different narrators because of the nature of the story but it took a while for me to not hate it as Bernard is who I am use too. I found both narrators to be captivating and I tune with the characters they were portraying. I also enjoyed the creative Adventure and style of writing than Mr. Brust brings to the table. He is by far my favorite authors of all time. He is a fantastic writer and this is well written (in terms of character descriptions, language, etc). However, it seems like he has run out of interesting storylines. The plot is really weak, the pace is slow, the detail gets esoteric, etc.